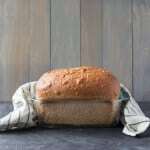 There’s nothing like baking homemade bread for your family, because you know just how much love and care goes into it, along with all the best ingredients. 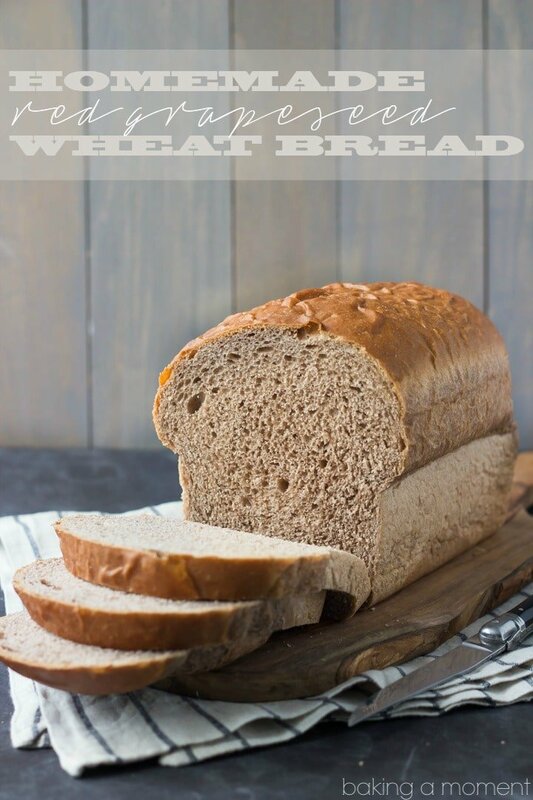 This recipe takes all that a step further, putting you in touch with the actual family farmers that grow the wheat for the flour. Red grape seed in the whole wheat flour blend lends a distinctive flavor to this soft and nutty sandwich bread. This is a sponsored post, written by me, and created in partnership with White Lily. All opinions expressed herein are straight from my heart. You guys! I made bread! This is kind of a big deal for me. I am not the most confident baker when it comes to yeast. But boy do I enjoy it. There is nothing quite like homemade bread. I love the feel of the dough, the aroma of the yeast, and of course slicing into a fresh, warm loaf and slathering it with melting butter is one of life’s great pleasures. I have had some homemade bread fails, but this certainly was not one of them. In fact, this was probably my greatest bread success. My kids are actually eating this bread! No small feat for the mom of two notoriously picky little buggers. I have always fed my kiddos whole wheat bread for their pb&j sammies and such, but of course it was of the store-bought variety. Honestly, this was not much of a leap for them. Texture- and flavor-wise, it’s very similar to the soft, slightly nutty flavor they are already used to. The big difference is, I can feel SO good about feeding them this bread, because not only do I know exactly what’s in it, but I even know exactly where the flour came from and how the wheat was grown. 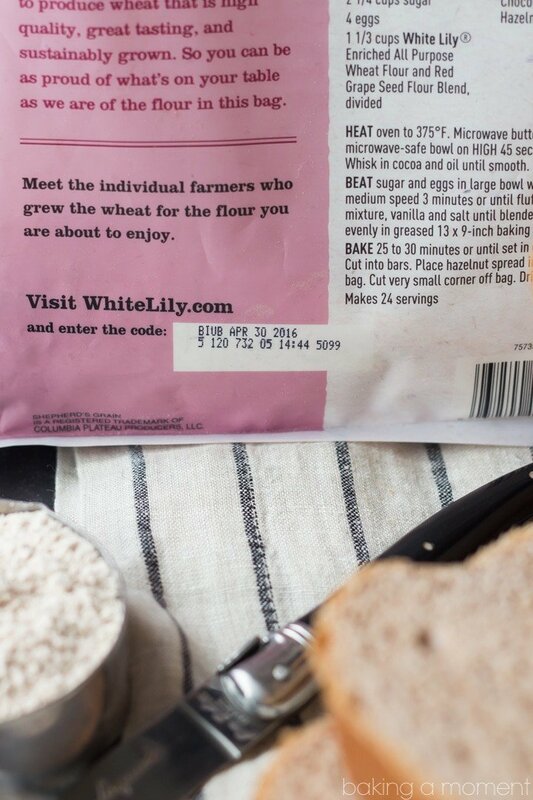 A few weeks back, I got an email from the folks at White Lily Flour. Are you familiar with White Lily? I knew a little bit about the brand, even though it has never before been available in my part of the country. Even as a Yankee from Philly, I knew that White Lily is a super high-quality product with a hugely loyal following in the south. There are some bakers who wouldn’t even consider making biscuits with anything else! The great news is that soon White Lily will be available nationwide, to any and every baker who wants nothing but the best ingredients for their families. They’ve started by teaming up with Shepherd’s Grain, a group of wheat farmers who have dedicated themselves to sustainable agriculture. 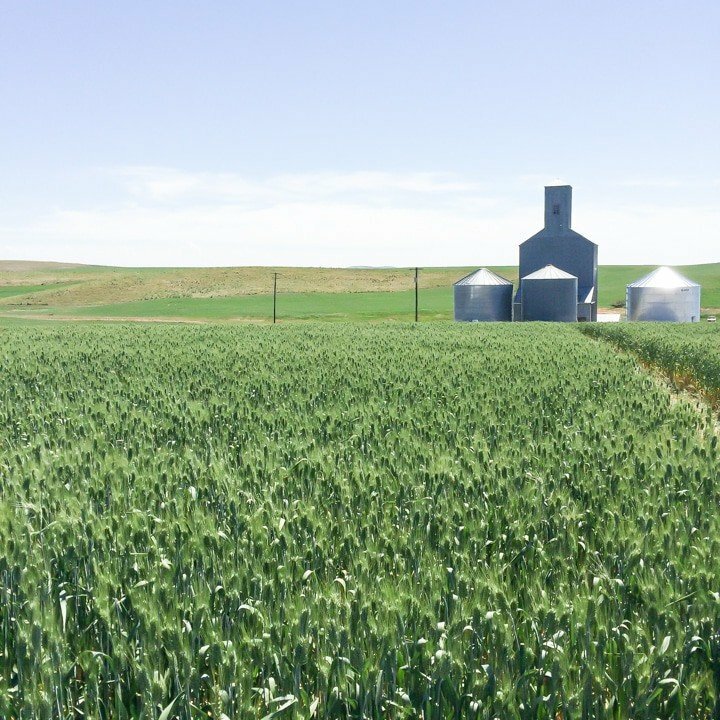 I ended up traveling to Spokane, Washington to visit one of the farms and meet one of the founders of Shepherd’s Grain. The experience was tremendous and I’m so happy to pass along some of what I learned! I grew up with dairy farms all around me, but Spokane was a whole different world. The wheat fields just go on for days. The farms are big and sprawling, but they’re owned by families just like yours and mine. Most of them have been handed down through the generations. They all seem to know each other, just like the neighbors they truly are. I, along with a handful of other bloggers and a few of the folks from White Lily, came together with Fred Fleming and his wife, on the patio of their farmhouse at Lazy YJ Farms. We ate this bread, along with lots of other wholesome and delicious treats, while learning about the farming practices of all the growers that are a part of Shepherd’s Grain. Fred and his colleagues are passionate about sustainable agriculture and it was inspiring to hear about their dedication to preserving the soil and ensuring that their harvest is pure, organic, and non-GMO. There is so much to it; I would highly encourage you to click here to learn more about the high standards they uphold, and some of the ideals they stand behind. For this bread recipe, I used the Red Grape Seed All Purpose Wheat Flour Blend. It is a combination of the whole wheat flour you’re probably already used to, blended with ground red grape seeds. The grape seeds are a by-product of the wine-making process, happening nearby to the wheat farms. Blending the flour with ground grape seeds lends a distinctive flavor to baked goods while also reducing the carbon footprint for both grape and wheat farms. My grandfather, Edgar W. Smith, was raised on a farm near Pendleton, Oregon. … He saved his money and during the depression he had some cash and was able to purchase much of the farm that my son, his mother and I are so privileged to enjoy today. … My father, Jackson W. Smith, joined my grandfather following WWII, and was actively engaged through the mid ’80s. I joined my father in 1973; 4 years after graduating from Washington State, and my son, Jeremy joined me following his graduation from Walla Walla in 2000. 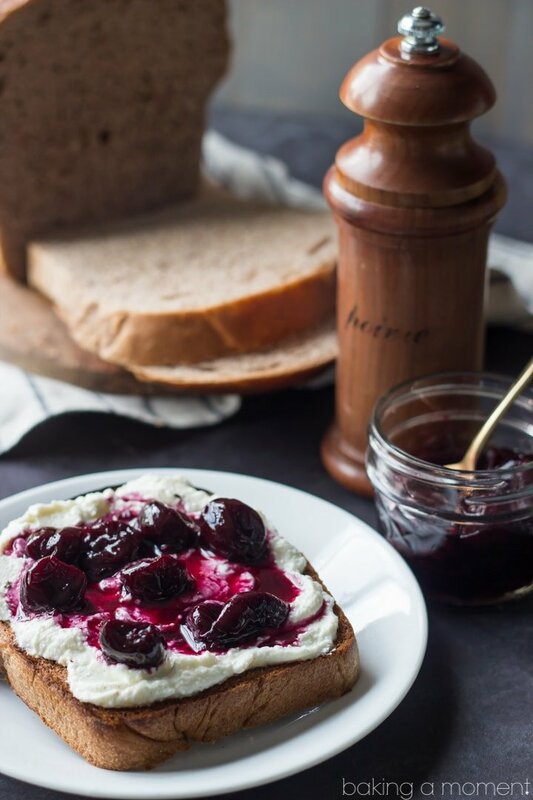 This particular bread recipe is can be used in so many ways, but I highly recommend toasting it, slathering it with creamy ricotta, and drizzling it with sweet summer cherry compote. A sprinkling of cracked black pepper provides a nice, spicy counterpoint. 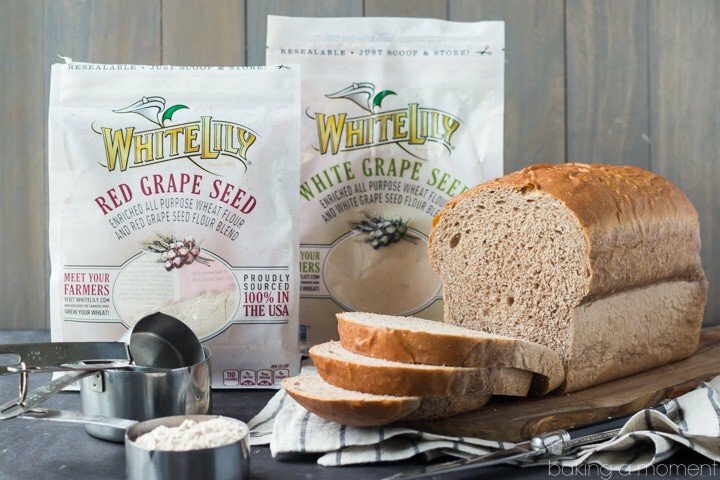 White Lily Red Grape Seed Flour Blend is now available through Smucker’s online store, along with their White Grape Seed Flour Blend and their Enriched All Purpose Wheat Flour. All of these flours can be subbed cup-for-cup with regular all-purpose flour. Soon, they will be available in retailers across the country. Keep an eye out so you can make this fabulous loaf for your family too! 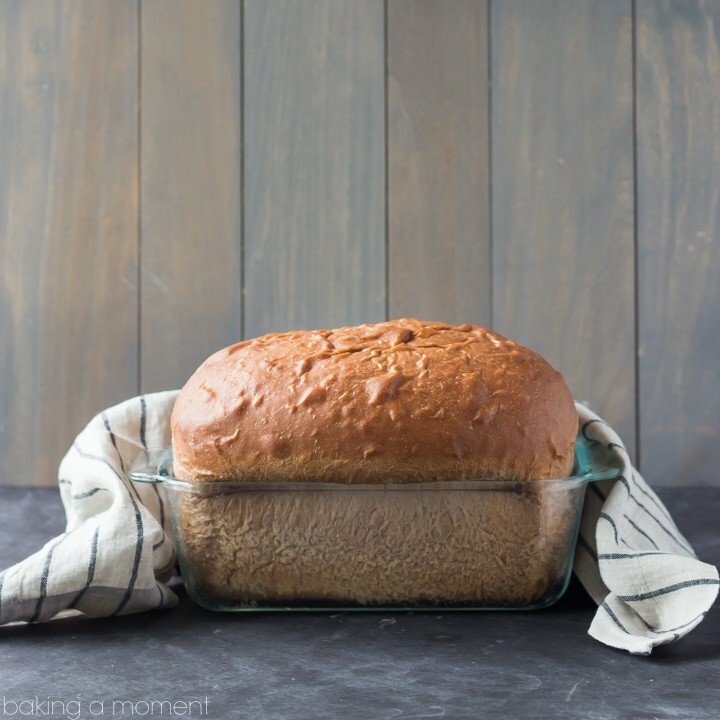 There's nothing like baking homemade bread for your family, because you know just how much love and care goes into it, along with all the best ingredients. This recipe takes all that a step further, putting you in touch with the actual family farmers that grow the wheat for the flour. Red grape seed in the whole wheat flour blend lends a distinctive flavor to this soft and nutty sandwich bread. Place the warm water in a large bowl and sprinkle the yeast on top. Set aside for 5 minutes to allow the yeast to proof. Add the honey and 2 tablespoons of the butter. Blend in 2 cups of the flour and the salt until moistened. Beat on medium speed for 3 minutes. Stir in an additional 1 1/4 to 1 3/4 cups flour, until dough pulls away cleanly from the sides of the bowl. Knead on floured surface, adding 1/2 to 3/4 cup additional flour, until dough is smooth and elastic, about 10 minutes. Place dough in large greased bowl and cover loosely with plastic wrap. Let rise in warm place until doubled in size, 30 to 45 minutes. Lightly mist a 9x5-inch loaf pan with non-stick spray. Punch down the dough and shape it into a loaf. Place in prepared pan, cover loosely with greased plastic wrap, and let rise in warm place until doubled in size, 30 to 45 minutes. Uncover dough, and bake 40 to 45 minutes or until loaf sounds hollow when lightly tapped. Brush with remaining 1 tablespoon butter. If you can't find this flour blend, regular whole wheat or all-purpose flour can be substituted in equal measure. This loaf makes a perfect everyday sandwich-type bread. Allie, this wheat bread is gorgeous and you know how much I love White Lily flour!!! I cannot wait to try this and your sweet summer cherry compote!! Delicious! I need to try this flour! It’s been popping up everywhere! Looks like you had fun in Spokane (which is close to me!) and this bread is stunning! Pinned! I think this might be the most beautiful loaf of bread I have ever seen!!!! Hahaha thank you my dear!! Wow! This loaf looks perfect! You totally nailed it. And looks like an awesome trip as well – I love Spokane! Super intrigued by Red Grape Seed Wheat flour. Going to have to look for it! Yes- definitely! It’s really good and I thought it was simple as can be to use. Thank you so much Liz! Yay! That’s so awesome that you went out of your comfort zone. Lovin’ this. Looks beautiful. You ROCKED it! You did a phenomenal job with this bread, Allie — it’s perfect! There’s nothing like homemade bread, and I’ve had the bug to make some lately — it’s been way too long. This is inspiring me to get on it. Pinned! Thanks for pinning Marcie and I’m so happy to have inspired you! I’ve had the bug for a while too so I was really pleased to have this recipe in my back pocket. Thanks so much for the sweet comment and have a great weekend, my friend! As always, your baking is outstanding and homemade bread is the best. So glad to hear about White Lily and I’m excited to give this a try. Thank you so much sweetie! I really loved it and so did my kids- which was the best part! They are so hard to please :/ Hope you have an awesome week Linda! It’s scary to step out of your comfort zone but the results are usually so rewarding. This bread looks fantastic, Allie! I have yet to make homemade bread. You have given me the courage to attempt it soon! You totally should! I am not at that point where I can develop my own recipes (yet), but as long as I follow a recipe I usually have pretty good results. Practice! And you are right- it’s so super rewarding. Thanks so much dear and have a great week! Yea, making my own loaf of bread is just so satisfying!! I actually haven’t done it in a while, but I’ll definitely need to get back on the wagon once this Whole30 thing is over! That red grape seed flour blend sounds great! 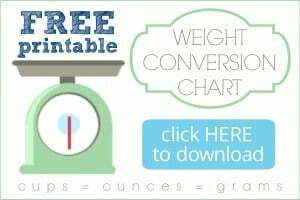 Gosh girl I am so proud of you with that Whole 30 thing! You are rockin’ it out already. Such an inspiration! Thank you so much for the sweet comment and keep on! Sounds like you had an awesome trip Allie! I love the smell of homemade bread baking! Perfect for a summer BLT! Oh my gosh girl now you have me craving a blt. You are so right- this would be perfect for that! Yes Allie you baked bread and it looks AMAZING 🙂 YOU DID IT haha 🙂 no, but all joked aside the bread look fabulous, and that flavor is crazy, I am so intrigued, I have to try it myself! Also, seems like a very fun trip, great you enjoyed it! I did! Thank you so much Katalina! I hope you do have a chance to give this a try- we really loved the results! Have a great week my dear! I kind of am too Medha! But this recipe worked out beautifully. Have no fear! Thanks so much and I hope your week is off to a terrific start! You totally nailed it Allie, this loaf looks perfect! I can just imagine how excited your boys must have been to have a slice of this 🙂 The red grape seed sounds terrific – loved the story behind White Lily! So glad you had such a wonderful experience there too! Thanks Kelly! I really did. And the recipe they provided worked out so well- I think it’s pretty foolproof! Will definitely be making it again 😉 Thanks so much dear and have a great week! Okay, that Trace Your Flour thing is pretty much the coolest thing I’ve ever seen! This bread is gorgeous! Isn’t it though?? I mean, I love that pride that you can have when you are feeding your family something that you made with your own two hands, but this just brings it to a whole new level. So glad you like it Ashley! Thank you so much sweetie! You… not a yeast baker?! You could have fooled me! This bread is GORGEOUS! Wow – just look at that height, and I can see just how light and fluffy it is! And oh my, that sweet summer cherry compote looks and sounds stunning! Just beautiful, Allie! I’m the same way! Yeast and I have a love/hate relationship sometimes, so I know the excited feeling well when a yeast item comes out fabulous! And this bread looks fabulous! Love it! It can be tricky right? I love working with it but I am just not at that level where I can develop original recipes. I was so happy to have permission to use this recipe from the folks at White Lily! So happy you like it Michelle, thanks so much for the awesome feedback sweetie! Girl – that bread looks like the best homemade bread EVER! Like, it should be a bread model or something for all the other breads to look up to! I’m loving it, it looks so fresh, fluffy and amazing! Hahaha! You are too funny! But honestly I thought the same thing when I first tried it in Spokane. It was the perfect bread to me 😉 Thanks! What a gorgeous loaf of bread, a success indeed! I’m seriously impressed, I always struggle with yeast. I enjoyed about reading about White Lily, too! Thank you so much Sam! Truthfully I am intimidated by yeast too but this recipe was flawless. I had no trouble whatsoever and the results were exactly what I was hoping for. This bread looks so delicious and perfect! I love making homemade bread and that new flour sounds so interesting. I’ll have to try it and hopefully mine comes out as gorgeous as yours! The flour is really good! I thought it was so easy to work with and the recipe was flawless. They know what they’re doing over there, lol! Thanks so much dear for reading and for the sweet compliments! I am a southern girl.. I know and love white lily flour! Your loaf of bread looks sooo delish- nice and yeasty, soft and fluffy. Pure homemade bread bliss!!! I love that you really took it over the top with the compote! Amazingly deliciousness up in here♡ pinned!!! Thanks so much for pinning Cheyanne! And for the sweet compliments! Okay, that is one awesome loaf of bread, girl!